Louis XVI ormolu and marble portico mantle clock by Robinet. The white enamel dial has concentric hands for seconds, day and month and is signed Robinet. 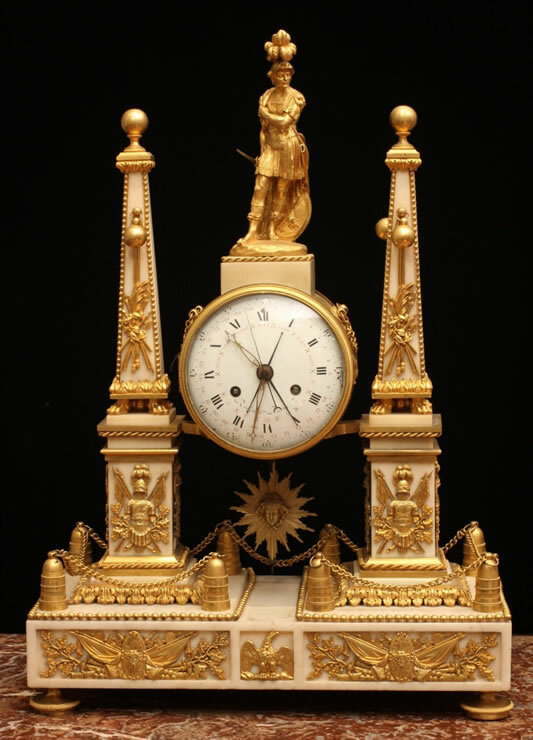 The movement is contained in a drum-shaped case surmounted by a well chiseled ormolu figure of Mars and suspended between tapered white marble obelisks which are applied with ormolu beading and military trophies and cannon balls. They rest on an ormoulu base with edges applied with beading and with chain fence work connected to buried cannons. The front is also applied with an eagle and military trophies and the whole is raised on circular feet.